Redmi Y2 is expected to be Xiaomi's latest smartphone in India at its scheduled New Delhi event on June 7. As per earlier reports, the Redmi Y2 will essentially be the rebranded Redmi S2 that was launched in China earlier this year. Now, speculations regarding the price, storage, and colour variants of the upcoming smartphone have already started to surface on the Internet. According to latest reports, the price of the Redmi Y2 in India will start at Rs. 9,999 and go up to Rs. 11,999. As per tipster Ishan Agarwal, Xiaomi is expected to launch the Redmi Y2 in India in two variants. While the base variant will come with 3GB of RAM and 32GB inbuilt storage, the top variant will be equipped with 4GB RAM and 64GB inbuilt storage. Furthermore, he claims that the two variants will likely be priced at Rs. 9,999 and Rs. 11,999 respectively. The tipster also added that the smartphone will be available in Dark Grey, Gold, and Rose Gold colour models. Notably, there has been no official confirmation about these details from Xiaomi, and the rumour should be taken with a pinch of salt. 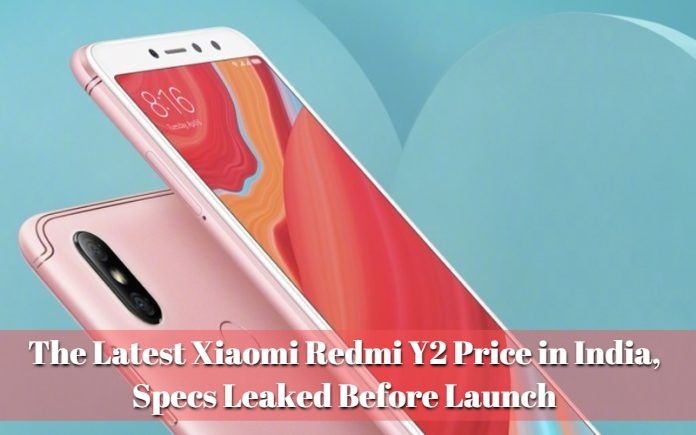 The Xiaomi Redmi Y2 is going to be an Amazon exclusive handset, and the e-commerce site has already listed the smartphone. The listing teases that the smartphone will come with a Snapdragon processor, selfie LED light, dual rear camera, and fingerprint sensor. The specifications clearly point towards the launch of the Redmi S2 India variant. The smartphone set to be the successor to the Redmi Y1 that was launched last year with selfie-centric features, including an LED selfie-light. To recall the specifications, we expect the Redmi Y2 to sport the same specifications as the Redmi S2. The dual-(Nano) SIM runs in this phone and other features are the great 720x1440 pixels 5.99 inch HD+ display with a 70.8% NTSC colour gamut. The phone is powered by Snapdragon 625 SoC, and dual rear camera with a 12mp primary sensor and 5mp secondary sensor. Further, it has a 16mpl sensor on the front. The front camera supported many features like AI Smart Beauty, AI Portrait Mode, Face Unlock and Front HDR also. It has a soft light flash and the storage options in the phone are expandable up to 256GB. This phone also has 4G VoLTE, Bluetooth v4.2, Wi-Fi 802.11 b/g/n, GPS/ A-GPS, 3.5mm headphone jack, and Micro-USB port and packs a 3080mAh battery.